Though not dangerous, Tinnitus, can be very annoying, isolating and affect sleep for those who suffer with it. 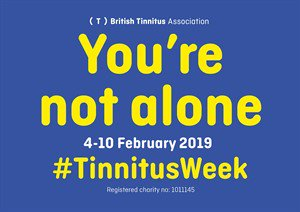 This year Tinnitus week runs from the 4th to the 10th Feb 2019. Therefore I thought I would share with you 3 things that might improve the condition and also what else I do to help. If you sufferer with tinnitus, you can get more information about the help available from the British tinnitus association. This week they also have a helpline, open over night on Tuesday for those who can’t sleep and on Wednesday a podcast on how tinnitus affects relationships. Over my 25 years or so in private practice, I have seen a number of people who, although did not come for help with tinnitus, mentioned it was one of their symptoms. Sometimes improving circulation to the ears can help. The first way this can be done is by taking Ginko Biloba. This is a herbal remedy and I recommend taking it in liquid form. This is because many people are not well hydrated and this makes tablets are less effective as the active ingredients don’t always get into the blood stream. The next two are with body work; first to the neck and shoulders and secondly to the jaw. The body work can involve massage to relax the muscles around the neck. These may be so tight, they constrict blood flow to the head by pressing against the arteries. Gentle stretching and elongation of the neck muscles helps free up the neck joints. This allows better movement of the neck and therefore less risk of flow being restricted. The jaw muscles are one of the most powerful in the body. If they are tight they can cause a condition called temporo-mandibular joint syndrome. You may have business/life worries that are subconsciously causing you to clench and/or grind your teeth without realizing – especially when you are asleep. Such activity can lead to a surprising number of damaging health issues throughout the body. Tightening the jaw in this way can be the cause of persistent headaches, tinnitus and sinus problems. But the repercussions of teeth grinding and jaw tensing extend well beyond that. But that is a different story and you can read more about it in this article about my presentation relating to the jaw . My treatment on the jaw is quite different to massage. I apply specific gentle pressure and movement on the jaw, all within the client’s comfort zone. This is done externally as well as internally. After which, I suggest some self help techniques and strategies, such as blowing raspberries and puffing out your cheeks. You can see some this on my jaw treatment video at the bottom of this blog. Yet the main thing which I have found makes the biggest difference to client’s lives doesn’t help treat the condition. It’s much more about helping them change the relationship they have with their condition, their body, and ultimately, this also changes the relationship they have with others. It is known that high levels of stress affect the condition. In view of the fact long term stress causes tension in the neck and reduces blood flow this makes perfect sense. But it also affects sleep and having tinnitus just tends to make this issue worse, as once they go to bed, everything is quiet they notice the noises more. Helping clients get to sleep and have a more relaxed attitude in general changes how they feel in different ways. They won’t tend to get so annoyed by the condition. They are better able to concentrate as they don’t get distracted by the noise. This means it no longer irritates them and sap their energy. They almost accept it as part of who they are, rather then fight it. In a way, they no longer get stressed about it. They also feel happier in themselves. The outcome of all this is that it reduces the isolation they might feel. They can get on with their life in a more confident and positive way. Essentially, I help clients change their relationship with their problem. Although some of this work is hands on, there is a lot people can do to help themselves. This is part of the coaching that can be done over the internet. So if you are struggling and would like to find out more, then contact me for a free taster session so you can assess for yourself if I can help you. ← Goals; winning the game of life!